Hope's Cafe: Mondetta Performance Gear Review and Giveaway!! I love finding new activewear/sport apparel. I have started aerobic walking every morning, and it is so important to have the right clothing. A few weeks ago I was contacted by MPG (Mondetta Performance Gear), and of course I was thrilled to have the chance to try out some of their apparel. I was given the opportunity to pick a top and bottom for my review. I chose the Destiny Top and Petal Capri. When I opened the package, I was immediately impressed with the items. While they are both lightweight material for comfortable workouts, they are also high quality. I love the invisible storage pocket in the Destiny Top. I always use my iPod while exercising, and this pocket is the perfect size to hold it. It's also great for stashing some cash in case I need a water while jogging. The top is made with ultralight Tactel nylon fabric that really keeps you cool while exercising. It has netted vents for extra breathing performance too. The Petal Capris are, to be honest, my favorite workout bottoms. Made of a polyester-spandex blend, these capris are ultra moisture wicking for supreme comfort. I love the turquoise waistband too; it adds a little flair to the capris! MPG is offering 25% off a one-time purchase to any of my readers!! Simply enter this code: hopelovesmpg at checkout!! "In our drive to develop the ultimate active apparel, we have achieved garments that feel and look so great on, you will want to wear them for everyday use. MPG has effectively blurred the lines between fashion and performance. Truly powerful action is the result of an equally passionate vision and drive to achieve. Behind the energy for perfection surges the will to attain it. In recognizing this balance, MPG has developed a line of clothing that seamlessly blends fashion and function, design and performance. The results are richly detailed pieces with a technical edge — an entire collection unparalleled in conception and construction. MPG, inspired by the smooth, strong movements of performers such as athletes and dancers, celebrates the drive, dedication and perseverance of these phenomenal individuals. MPG applauds their unyielding pursuit of excellence, through sacrifice and discipline, with respect and admiration. The brand’s versatility allows for more than just function; it embodies style and comfort by offering a range of clothing to suit any activity in any environment, at the apex of vision and vigor." MPG is giving one of my readers their choice of Top or Bottom from the Spring Collection (excluding outerwear)!! Go to the MPG Sport website and tell me what item you would choose if you won! 1 entry-Follow MPG Sport on Twitter. 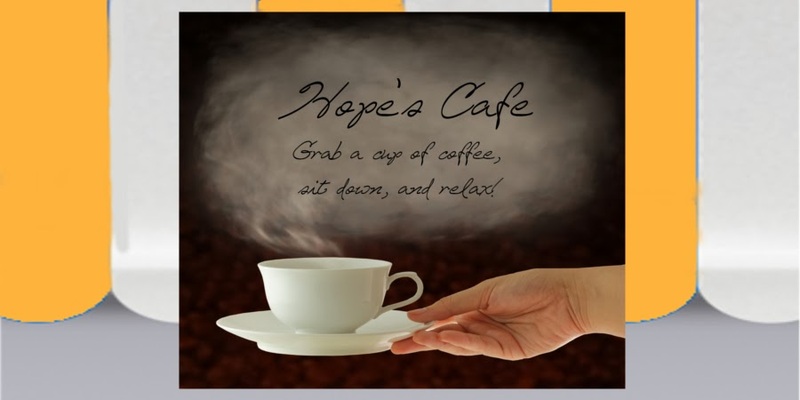 *3 entries*-"Like" MPG Sport on Facebook and tell them you entered the giveaway at Hope's Cafe! 1 entry-Tell me what you would wear your new MPG Sport apparel for! This giveaway ends Thursday, June 9, 2011, at 11:59 p.m. Please leave a valid email address in each comment, as this is how the winner will be notified. Winner will have 48 hours to respond, or another winner will be chosen. Giveaway open to US residents only. Disclaimer: I was not monetarily compensated in any way for this post. All thoughts and opinions are mine. All quotes taken from the MPG Sport website. I like the Bijou top! If I won I would love to have the Paragon hoodie! If I won I would wear mine to go running... and everything else! I entered Yvonne-Estelles review and giveaway. I love the Leap style bottom! I would wear my new clothing playing tennis! I love the Petal Capris also. I like the Destiny top. I would wear my new sports clothes for working out at home and go jogging outside. Follow MPG Sport on Twitter. commented on Fathers Day office chair post. commented on Olive Oil lamp review. I would choose the Bijou Ombre jersey racer back strap tank in Bright Coral! I like Petal pants and Aire top. I have started taking Zumba classes (group Latin dance-type workouts) and I love them! I would love to be "shaking it" in a piece from Mondetta Perfomance Gear! Entered Beachbody Slim in 6 giveaway. I like the Bijou Top. Thanks! I'd wear my Bijou MPG sport apparel for hiking and biking. Thanks! I would choose Destiny top. I would wear the gear for running. I like the lift top. I Follow MPG Sport on Twitter. I would wear my new MPG Sport apparel while jogging outside! I entered the HSH-Green Interior Design Book Giveaway. I like the petal capri. i like mpg on fb 2. I like mpg on fb 3. I would wear my gear when I do my workout dvds. I entered cold stone giveaway. I entered dali decals giveaway. Thanks for the review and giveaway chance. I like the Celeste bottom. I'd wear it to go biking! I like the Aire top. Don't think it's the right collection but I really like the Savvy top as well. I need to tone and am about to start a workout routine for that. I would wear it for that. I am going to be 35 very soon and things are starting to shake and sag that shouldn't (or I would prefer they didn't). Lol. Like MPG Sport on FB and told them I entered. Like them on FB 3. And follow them on Twitter as well.